Bacterial symbionts that manipulate the reproduction of their host to increase their own transmission are widespread. Most of these bacteria are Wolbachia, but recently a new bacterium, named Cardinium, was discovered that is capable of the same manipulations. In the host species Brevipalpus phoenicis (Acari: Tenuipalpidae) this bacterium induces thelytoky by feminizing unfertilized haploid eggs. The related species B. obovatus and B. californicus are thelytokous too, suggesting that they reproduce in the same remarkable way as B. phoenicis. Here we investigated the mode of thelytokous reproduction in these three species. Isofemale lines were created of all three species and 19 lines were selected based on variation in mitochondrial COI sequences. All B. phoenicis and B. californicus lines (10 and 4 lines, respectively) produced males under laboratory conditions up to 6.7%. In contrast, males were absent from all B. obovatus lines (5 lines). Additional experiments with two B. phoenicis isofemale lines showed that males can be produced by very young females only, while older females produce daughters exclusively. For most lines it was shown that they are indeed feminized by a bacterium as treatment with antibiotics resulted in increased numbers of males up to 13.5%. Amplification and identification of specific gyrB sequences confirmed that those lines were infected with Cardinium. Three out of the five B. obovatus lines did not produce males after treatments with antibiotics, nor did they contain Cardinium or any other bacterium that might induce thelytoky. In these lines thelytoky is probably a genetic property of the mite itself. Despite the different causes of thelytoky, flow cytometry revealed that all 19 lines were haploid. Finally, the taxonomic inferences based on the mitochondrial COI sequences were incongruent with the classical taxonomy based on morphology, suggesting that a taxonomic revision of this group is necessary. 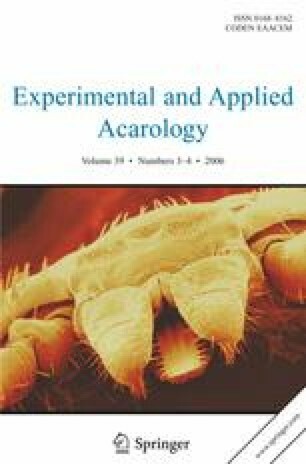 We thank Dr. G. de Moraes and N.C. Mesa for morphologically identifying the mite species. We also thank the people at the Burger’s Bush tropical greenhouse for allowing us to collect mites and their help in doing so. The advise by M. Stift and R. Bregman on the flow cytometry analysis was much appreciated. We thank Prof. S. Menken for his remarks on an earlier draft in this manuscript. This study was supported by the Netherlands Foundation for the Advancement of Tropical Research (WOTRO), grant number W89–141.